Roulette first came out as a game in France during 1800s. Now, it is a highly popular European game of gambling and Monaco's Monte Carlo is one of the famous centres of gaming for roulette. Around eight players play versus the house that shows up in the form of a croupier or dealer. This dealer then spins the wheel and deals with payouts and bets. In French and European roulette, there are 37 slots on the wheel where there is a zero and 36 numbers. In American roulette, however, the majority of roulette wheels come with 38 slots because there are two zeros present. Every player will buy in different chip colours so there is no confusion with the bets. After the game, winners can exchange their chip colours for regular cash chips. The special chips have values on them, as well, and different denominations come in different colours. These chips can later be taken to the desk where you will get real money for them. 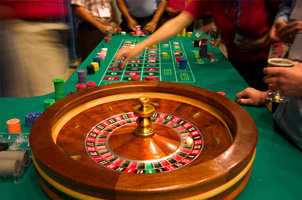 When it comes to roulette, bets are placed on the numbers outside or inside the layout of the table. After everybody places their bets as needed, the dealer begins to spin and drop the ball. Only several seconds prior to the ball's drop, the dealer will announce that bets can no longer be made and from then on out, nobody can change or place bets until a slot are chosen. After the dealer puts the dolly for the winner on the table and gets rid of every losing bet, players can start putting new bets as the winners get paid out. Winning bets are those that are around or on the slot that the ball dropped on. Any bets outside the layout also win, provided the number that won is actually represented by it. In order to become a roulette winner, players have to predict the slot on which the ball falls after every spin. There is nothing easy about this. As a matter of fact, chance is vital here. Several players choose winning numbers or "hot" numbers as they call them, because they believe they will appear more. Other people check which numbers have failed to show up and place bets on them because they think they will soon have their turn. Still other players bet on a lot of numbers for higher chances of winning with each spin. However, this will only reduce the payout significantly. Players who are more methodical put certain roulette methods or systems to use, as well as systems of money management, if not both.